Fiberglass - Ultimate performance in every season. Ultra®, as the name implies, is the ultimate window frame material. Ultra fiberglass windows combine a traditional wood-frame profile with the strength, stability and zero maintenance of fiberglass. Our Ultra series withstands the harsher sides of Mother Nature like no other window, yet look like painted wood. You get all the beauty, but none of the maintenance. 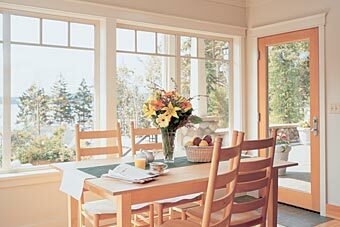 You can order our fiberglass windows in seven baked-on standard exterior colors. A wide selection of hardware and grid options is available. Designed to be the ultimate window and door frame material. Milgard SunCoat® Low-E glass for superior energy savings and reducing fabric fading.